This is part of a series of campaigns that myself and Mark Stevens played by email. It was run as a "solo" campaign with a GM; one player plays out the arena fights, whereas the GM controls the storyline between fights. The idea was that the "in-between" events were a set of multiple choices (or played out as a skirmish using the Song of Shadows and Dust rules), and that it should not be too dangerous for the gladiator. The first campaign we played was Leptis Magna, this is our second campaign. The roles were reversed, I was the "player" using my miniatures and conducting the fights, Mark was the "games master". It was played to a conclusion in 3 weeks in May 2015; all communication was via email. 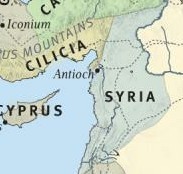 The campaign is set in Antioch, in the province of Syria in the last years of Nero's reign. The timeline follows on from the end of the Leptis Magna campaign. From my list of gladiators, I used Scorpu, a Retiarius, and Gallus, a Secutor. Below are the emails that passed back and forth - Marks entries are in blue, mine are in green. Any post edit comments are in red. I will post the whole campaign, round by round, on a weekly basis. It is 67 AD in the Roman Empire, in Antioch, Syria. 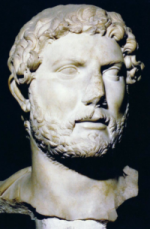 Nero is Emperor, but is unpopular and lurid stories circulate. However for most people away from Rome, and not politically involved, it does not mean very much. Of more interest is the news from Judea in the south where the Jews, always troublemakers, have revolted against Roman rule. Last year came the shocking news of a major Roman defeat by these Jews. Now, reinforcements have arrived and several legions have marched south under T F Vespasianus, to deal with them. There has been some unrest in the city of Antioch, as the large Jewish minority (always hating the Greeks who are the dominant population) stirs up trouble in the markets, demanding more religious freedom, and execution of members of some bizarre sect that has apparently broken away from them. Marcus Ulpius Ahenobarbus ("brass beard") is a former gladiator - probably from the Rhine provinces, he himself cannot really remember - who made it in Antioch, a major city of the Empire. After he won Primus Palus on the local circuit, he was freed and his old Master financed him to start a small ludus. He must now start with his small squad of inexperienced men and try and establish himself. Luckily the patronage of his former master, Gaius Ulpius Athenodorus, will come in useful as Athenodorus (a romanised Greek) is an influential man in the city. As a freedman, Ahenobarbus took his middle name from his former master as a sign of respect and clientage, as is the usual practise. 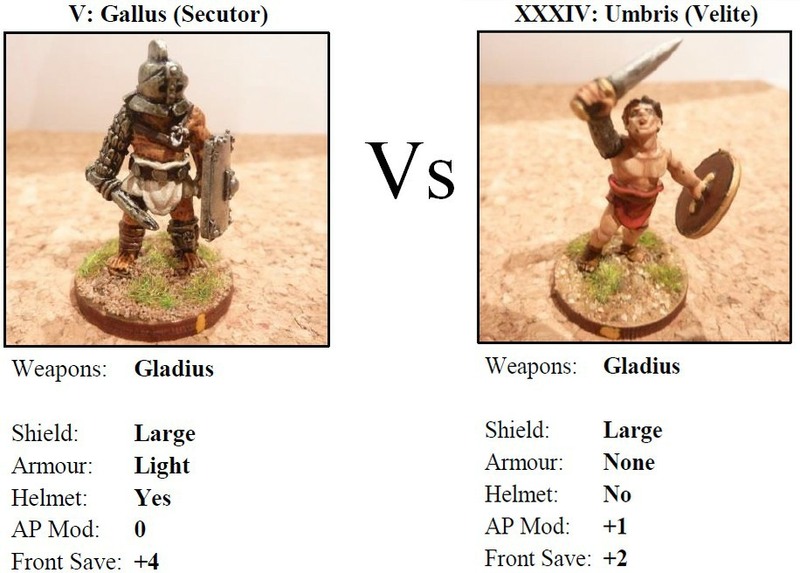 Ahenobarbus's two most promising recruits are SCORPU (a Retiarius, as was Ahenobarbus himself in his earlier career) and GALLUS (a Secutor). For the Trojan Games coming up next week, Ahenobarbus has been able to get these two fighters onto the roster, although only in the late afternoon shift. However, as he reflected, you have to start somewhere. The potential prize money is only a measly 2 aureus per game, although the City collegia, who sponsor these Games, can give a further 2-4 aureus as a donative to a fighter who puts on a really good show. None of these men has any skills, they are all rookies. In preparing his men for their first fight, Ahenobarbus emphasises the high stakes: the whole future of the ludus could be on the line. On a blistering hot day they took the field. This was a real street fight blow for blow type thing. At first, Umbris with his better speed got some strong side attacks in, but could not cut through the armour of Gallus. The crowd appreciated his enthusiasm though and he started to gain favour. Gallus looked out of sorts but did some counter attacks, but the shield of Umbris saved wounds a number of times except for one hit that got through for 2 damage. Umbris then did a very strong attack on Gallus’s unshielded flank, doing 6 damage, seriously wounding Gallus. Gallus, though slowed, continued to attack earning the praise of the crowd, and he had to draw on this to keep him going. Just when all seemed lost, Gallus made the perfect strike (double 6 event) and took down Umbris, who, unexpectedly, fell. Umbris survived the appeal as he won some praise for his efforts, and many thought he was the better gladiator. A feature of the fight was both gladiators working the crowd quite well. Umbris: lost 10 from 9 strength. Won 3 favour points, spent none. Survived Appeal with final result of 9. Something seemed amiss in the Ahenobarbus ludus, first there was the lucky win of Gallus, and now Scorpu seemed underdone, with a 7 strength vs a 10 strength Astinax. 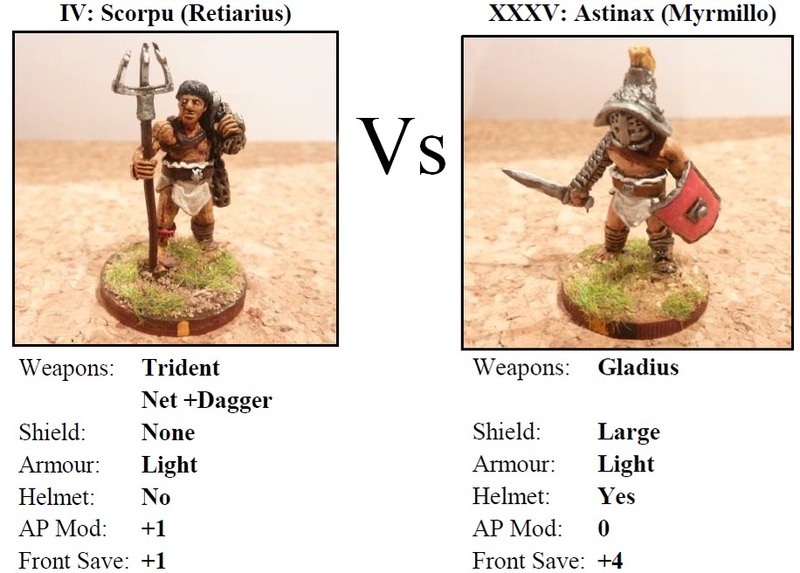 Despite being the slower gladiator, Astinax charged up to a sluggish Scorpu and hit him for 6 damage. Scorpu recovered slightly and got the trident through for 1 damage. Scorpu, (with atrocious AP rolls) kept his distance but Astinax rushed him. At close quarters, Scorpu dislodged the shield from Astinax (double 5 event) in a disadvantaged attack. Astinax, though, was able to jump back, pick up his shield, advance and attack (with really good AP rolls), A further hit of 3 felled Scorpu who appealed, but the crowd was not generous and gave him the thumbs down…. Unlike the first fight, neither gladiator was able to work the crowd, a very dour, spartan affair, no wonder the crowd was in an unforgiving mood. Scorpu: lost 9 from 7 strength. No favour points. Lost Appeal final result of 6. Umbris: lost 1 from 10 strength. No favour points. Win.